Recommendations regarding appropriate footwear features that will meet the special needs of your condition and lifestyle are also part of your treatment. 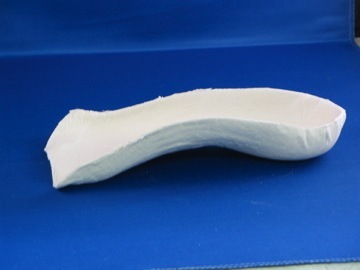 Sound Orthotics has a variety of casting methods available depending on your condition or foot problem. All are 3D (not 2D) methods of capturing the image of the foot for custom work. These include foam box, plaster slipper casting, and laser scanner. By far our favourite method is the non-weight bearing plaster slipper cast method which allows the pedorthist to control the foot in the most optimal and beneficial position for correction. Sound Orthotics also manufactures all custom foot orthotics on-site, a function we provide for additional clinicians coast to coast. We have strategic partnerships with additional providers for footwear, compression stockings, bracing and additional products but all custom foot orthotics are made by us right here is Parry Sound using the latest in CAD/CAM design and milling. Every patient is provided with helpful instructions regarding the best practice for acclimating and caring for dispensed products and of course, your pedorthist will take whatever time is needed to thoroughly answer questions. Yearly follow-ups to track your overall progress. While a prescription from your doctor is not mandatory, it is highly recommended. Medically prescribed devices do not attract sales tax and are eligible to claim on your income taxes. Additionally, if you have extended health care coverage for custom foot orthotics, off-the-shelf orthopaedic shoes, custom orthopaedic shoes, shoe modifications, compression stocking (for higher compression strength), knee bracing, or other medically prescribed items, you will require a prescription (Rx) from your doctor. Lastly, if you have already discussed this treatment with your physician, or have already received a prescription in the past, we would be happy to contact your doctor for an updated prescription on your behalf, with your permission, of course. In that case, please contact us for a repeat appointment. Is your service or products covered by OHIP? No. Sadly our services and products are not currently covered by OHIP. Please call to discuss your situation if we can be of assistance. The 1st visit is approximately 1 hour. If you provide your email address at the time you book your appointment, you will be able to fill out your contact information electronically. However you can do so in person at the start of your appointment if you prefer or if you don't have email. Marcel, our Certified Pedorthist, will perform your biomechanical assessment and gait analysis. After deciding on a course of treatment, should custom orthotics be required, he will take a 3D image of your feet, usually using a non-weight bearing plaster cast method. Other 3D methods are also used on a case-by-case, and less frequent, basis. You will NOT receive your custom orthotics that day. We WILL make them on the premises though and have you back for your fitting visit in approximately two (2) weeks. This fitting appointment is approximately 15-20 minutes. You will also have a 1-month follow up visit to make certain that the treatment is working. Adjustments to your custom foot orthotics, if any, can be made on the premises generally while you wait. Lastly, you will be booked for a 1-year follow up to keep you in tip top shape and head off any problems before they arise. You may of course see us earlier if your situation changes. Your completed contact information (if you gave your email at the time of booking an appointment). All the shoes you are currently wearing. Any special claims information: NIHB, WSIB, Ontario Works, Veteran Affairs, GreenShield including your card. I have my Native Status Card? Are orthotics covered? All claims to NIHB must be submitted on a case-by-case basis, however, generally, NIHB will cover the cost of custom foot orthotics, up to a maximum of $450.00 for one (1) pair every two (2) anniversary years. What do I need to bring to my 2nd (fitting) appointment? Please bring those shoes with you to your fitting appointment. Leave the existing linings in the shoes, we will remove them for you. Please bring an old pair of running or walking shoes to your fitting appointment. You will be able to take your orthotics with you when you are shoe shopping and get a better fit! We currently accept cash, cheque, debit, VISA and MasterCard.